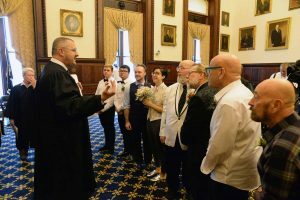 October 11, 2018 (Philadelphia City Hall)—Mayor Jim Kenney, Director for the Office of LGBT Affairs Amber Hikes, City Representative Sheila Hess, and Philadelphia Parks & Recreation Commissioner Kathryn Ott Lovell were joined by esteemed LGBTQ+ judges Daniel Anders, Ann Butchart and Barbara McDermott, and LGBTQ+ couples for a very special wedding ceremony and vow renewal in honor of the 30th anniversary of National Coming Out Day. The ceremony, Out in Love, was a local observation of love and pride in the LGBTQ+ community. Four couples participated in the event. Two couples were married for the first time and two couples renewed their vows. One couple renewing their vows have been together nearly 50 years while another met one year ago before tying the knot today. Another newlywed was married on the occasion of his 25th birthday. The participants brought along cheering friends and relatives to witness the moment. Some of the couples said they were excited to be part of such an important event, which they hope will be an annual occurrence. Newly married were Emmett Binkowski and Maggie Alvarez of West Philadelphia, and Romeo Lopaz and Hok Hi of Northeast Philadelphia. 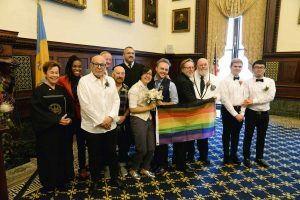 Joseph DiDio and Charles Massucci of South Philadelphia, and Neal Orzeck and Mark Jerde of Manayunk, renewed their vows. The weddings originally were scheduled for Love Park in front of the iconic LOVE sculpture, but inclement weather brought the couples to a new home of matrimony at City Hall.